How do I use map maker to add locations? You can use map maker to pin locations to your map individually, or in bulk by uploading a list of locations from a spreadsheet or table. The map maker menu bar is located at the top of your map. Select ‘Additions’, and then choose ‘Add Marker – Simple’ or ‘Add Marker – Detailed’. To add entries quickly, the ‘Simple’ option should be sufficient. If you want to add complex entries with multiple field values, and possibly with audio and video, choose the ‘Detailed’ option. You can specify the location of your pin by either entering the address information, or clicking on a location on the map. Whichever add option you choose, you can preview your entry before adding. Select ‘Submit’ to add your entry. 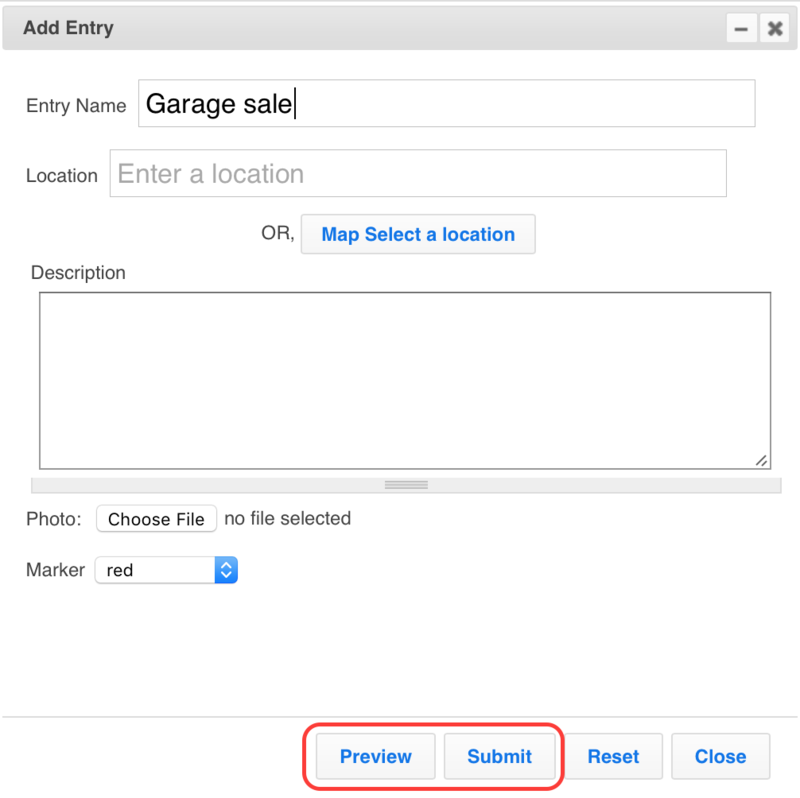 To use the map maker for adding multiple locations, read the section on Spreadsheet Uploads. Can I use map maker to add locations using UK or other international postcodes? Yes, our map maker supports most countries in the world for adding locations. Can map maker import entries from other programs to create a map? Yes, contact files from other programs can be easily used to add multiple locations on your map. Generate a spreadsheet for the records contained in Salesforce, Outlook, Access, ACT, or other popular contact management programs. Then, follow the map maker steps outlined in our Spreadsheet Uploads section. Is there a limit to the number of pins I can map? If you are adding entries through upload, you’ll need to subscribe to the appropriate plan to add more than 100 pins on your maps. The Professional Plan will allow you to add up to 2,500 pins per map, the Professional Publisher up to 5,000 per map, and the Enterprise up to 20,000 per map. If you need additional limits on any of the plans you can purchase additional Upload Credits in batches of 1,000 or 2,500. How can I set the color of my markers? Marker colors can be defined while adding entries to your map by selecting a color from the drop-down list. Once your entry has been added, you can change the color by double-clicking on the marker. This will show you a dialog that you can use to change the entry properties. Simply select a new marker color from the drop-down list, and click ‘Submit’. How many different colors can I use for my markers? Black, blue, brown, burgundy, candle, cloud, forest, fuscia, green, grey, lavender, light blue, light green, light purple, light yellow, lilac, maize, mold, olive, orange, purple, red, red dust, sky, spring, sunflower, sunset, teal, tree, white, and yellow. How do I change the appearance of my pins? To change the default appearance of markers, select ‘Map’ then ‘Settings’ in the map maker menu, and then the ‘Marker Display’ tab. Then, you can set your markers to different shape or size. You can also enable clustering of markers close to each other, or see your map as a Heat Map. Can I label my pins with a number or letter? You can use one of the fields from your locations to label your pins. To do this, select ‘Map’ then ‘Settings’ in the map maker menu, and then the ‘Marker Display’ tab. Check the option for ‘Label Markers using Field’. Can I change the information shown with a marker? Yes, you can adjust the information shown in the information bubble. Select ‘Map’ then ‘Settings’ in the map maker menu, and then then the ‘Information Bubble’ tab. For example, you can hide sensitive information like phone numbers, emails or street addresses, show or hide field names, include direction links, print icon, etc. You can also set the defaults for your photo and video width and height, and whether the audio starts playing by default or not. How do I create a custom marker icon? Go to ‘Map’ then ‘Marker Icons’ in the map maker menu on top of your map. You can upload your own image to display for certain marker colors, with a given width and height. Can I download my marker entries? Yes. Go to ‘Map’ then ‘Save as CSV’. A CSV file with the map marker coordinates will automatically download. How do I delete markers and entries from my map? 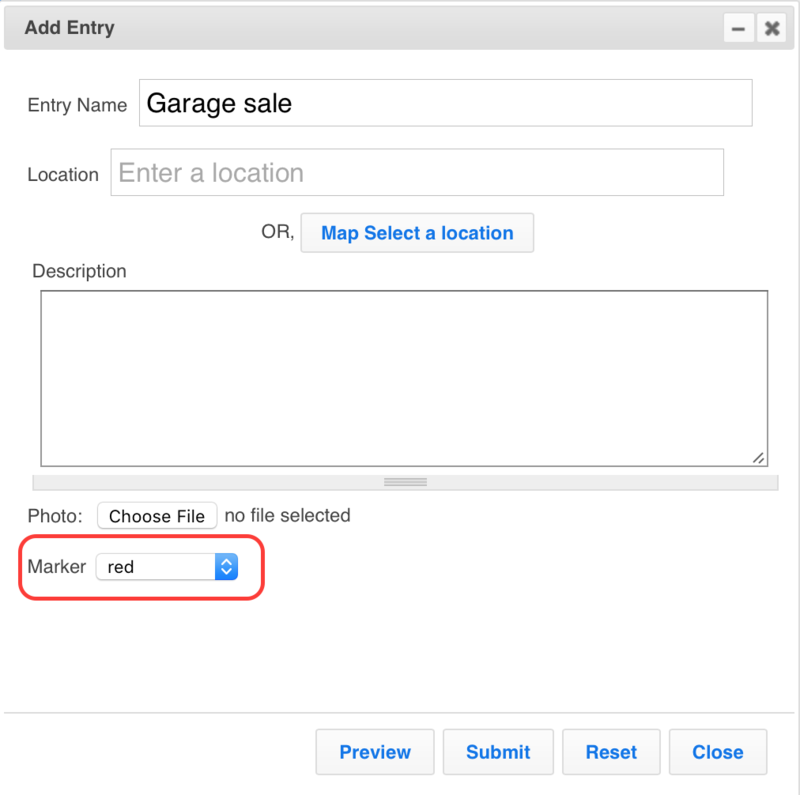 You can delete individual entries on the map by double-clicking on a marker and using the ‘Delete’ button in the resulting dialog. If you have an upgraded account, you can delete multiple markers at once. Go to Deletions >Delete some markers, then check the appropriate boxes from the list in the pop-up window. With an upgraded account, use Deletions > Delete All Markers to delete all markers from the map. 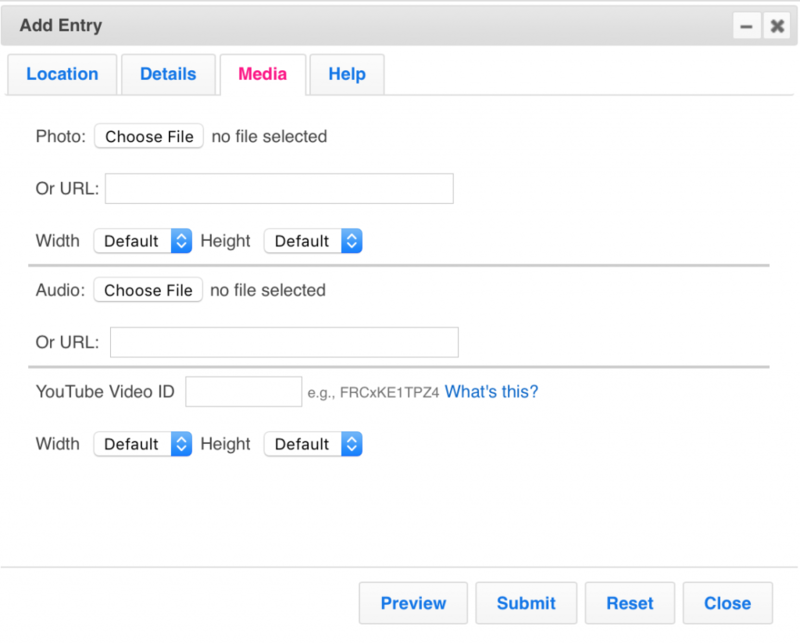 Can I add photos, audio files, or video to entries? Yes. To do this, select ‘Additions’ then ‘Add Marker – Detailed’. Select the media tab. You can add one uploaded or web-based photo, an uploaded or web-based audio file, or reference a YouTube video. One photo, audio file, or YouTube video is supported per marker (pin). How do I change which fields are available for a marker’s information bubble? Go to menu item ‘Map’ then ‘Marker Fields’ on the map maker menu bar at the top of your map. Then, change the field names, re-arrange their order, or add new marker fields using the resulting dialog.